The architects’ department of The Co-operative Wholesale Society Limited commissioned G. Bajio, a Hungarian artist working in its offices, to produce a piece of public art for its new building on the corner of the Town Square in 1958-9. 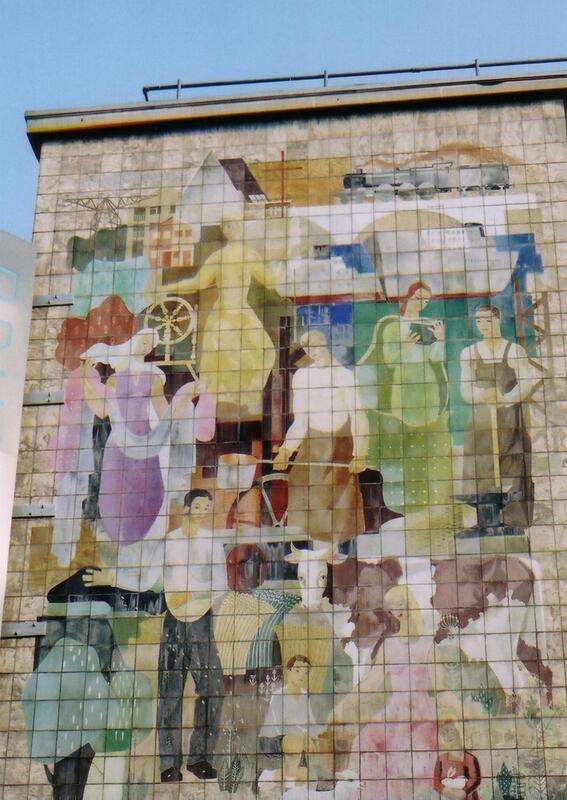 A ceramic mural, 27’ by 20’, it depicts symbolic figures of the four cornerstones of a balanced economy; industry, commerce, transport and agriculture. The spinning wheel and its products represent textiles and consumer goods, the steelworker represents heavy industry, a teaching figure represents science and technology, and agriculture forms the background to the family. www.waymarking.com says on its website that the slightly idealised old-fashioned imagery of the mural was intended to depict “the spirit and activities of the Co-operative movement as a whole and in relation to Stevenage”. This mural represents, to me, the hopes and promises of the early 1950s and the development of New Towns and New Hopes. I love it and really hope that no-one will decide to update the area and obliterate it. I always liked this mural, it was a little bit rural with cows on , and that, but I felt it symbolized that pseudo communist~socialist atmosphere that was lurking, especially amongst the youth at the time. It is a part of the town’s heritage. I was in Dresden the other day and was pleased to see a similar mural there! And dont forget that had been Deutsche Demokratische republik !